Eisbaeren Berlin team captain ANDRE RANKEL (24), the 27-year-old winger who has already represented Germany at seven major international tournaments (34 ga, 1 go, 4 pts) in his career including the 2010 Winter Olympic Games hosted by the western Canadian city of Vancouver, shields the puck from Hamburg Freezers’ Canadian legionnaire COLIN MURPHY (11), the former Michigan Tech University left wing now skating his fourth season in the Deutsche Eishockey Liga, during the European Trophy contest at the O2 World Arena Berlin earlier this season. Eisbaeren Berlin forward T.J. MULOCK (15), the 27-year-old veteran who currently leads the German capital city club with 28 points (eleven goals) from 26 games in the domestic Deutsche Eishockey Liga, finished in third place on the scoring chart among all players participating in the 32-team European Trophy tournament for 2012; the productive Mulock, who was held off the scoresheet in the futile Red Bull Salute quarterfinal against Austrian club UPC Vienna Capitals, did end up as the 2012 European Trophy tournament leader with eleven assists. Eisbaeren Berlin’s Germany national team goaltender ROB ZEPP (72), the experienced 31-year-old who stopped 203 of 212 shots faced in the 2012 European Trophy tournament altogether, prepares to thwart threatening UPC Vienna Capitals left wing ZDENEK BLATNY (13), the 31-year-old import from the Czech Republic who previously skated 25 games (3 go, 0 as) for the Atlanta Thrashers and Boston Bruins in the National Hockey League, during the Red Bull Salute quarterfinal contest at the Albert Schultz Halle in Austria. Eisbaeren Berlin goaltender ROB ZEPP (72), the 31-year-old veteran who was chosen as one of the the game’s three best players in four of the seven European Trophy matches in which he participated this season, fights off the puck and sticks his glove in the midsection of UPC Vienna Capitals’ veteran Canadian legionnaire BENOIT GRATTON (25), the 35-year-old native of Montreal who made 58 appearances (6 go, 16 pts) in the National Hockey League before signing with Swiss side HC Lugano in the summer of 2004, during the quarterfinal contest of the 2012 Red Bull Salute – European Trophy Finals held at the Albert Schultz Halle in Vienna. 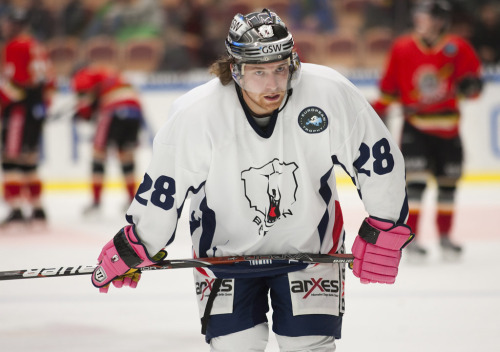 HF Lulea defenseman ROBIN JAKOBSSON, the 26-year-old signed this past off-season from Allsvenskan (second division) side IF Tingsryd, attempts to disrupt puck-carrying BK Farjestad Karlstad left wing MARTIN RYDMARK (23), the 26-year-old who has represented Norway at six major international tournaments (38 ga, 2 go, 6 pts) in his career and was acquired this summer from Elitserien outfit IK Timra, during the all-Swedish Final of the 2012 Red Bull Salute – European Trophy at the Slovnaft Arena in Bratislava, Slovakia. A pair of goals from seasoned Finnish import JOONAS VIHKO and flawless netminding from veteran DAVID RAUTIO were more than enough to enable Swedish club HF LULEA to shutout fellow-Elitserien side BK FARJESTAD KARLSTAD 2-0 in the FINAL of the 2012 RED BULL SALUTE – EUROPEAN TROPHY competiton and lift the silverware as well as collect the prize money of 50,000 Euros. Vihko, the 31-year-old veteran who was selected in the fourth round (# 103 overall) of the 2002 National Hockey League Draft by the Anaheim Ducks, grabbed his first goal on the power play the 11:15 mark of the first period. This after experienced left wing BK Farjestad Karlstad CHRISTIAN BERGLUND, the 32-year-old who skated 86 NHL games (11 go, 27 pts) for the New Jersey Devils and Florida Panthers once upon a time, had gone to the penalty box for interference exactly halfway through the first period. Right wing LINUS PERSSON, the 26-year-old who signed from second division IK Bofors Karlskoga this past summer, and JOHAN FRANSSON, the 27-year-old defenseman who was selected in the second round (# 34 overall) of the 2004 NHL Draft by the Dallas Stars, picked up the assists for the northern-most club in the entire Swedish elite league. After scoring an all-important first goal, HF Lulea, who are currently standing third in the 12-team Elitserien table, were able to adopt the cautious and conservative tactics that are not foreign to Swedish ice hockey to begin with. BK Farjestad Karlstad, who ranked fourth in the domestic top flight heading into the 2012 Red Bull Salute – European Trophy Finals, actually did have almost a minute of a 5-on-3 power play to work with late in the first period. And the green-shirted side might have equalized, as well, were it not for the fine efforts of a focused Rautio. Finnish import SAMI SANDELL (40), the 25-year-old left wing who played two seasons of Canadian junior for the Brandon Wheat Kings in Western Hockey League, watches as in-form netminder DAVID RAUTIO (1), the former Sweden U-20 international who had played less than half of HF Lulea’s matches (12 of 32) in the Elitserien this season but, nevertheless, does boast the best save percentage (.947) in the entire domestic top flight, turns aside another shot from BK Farjestad Karlstad during the all-Swedish Final of the 2012 Red Bull Salute – European Trophy staged at the Slovnaft Arena in Slovan, Bratislava. BK Farjestad Karlstad, who already earned 25,000 Euros by winning the West Division in the qualification round of the 2012 European Trophy tournament and were guaranteed at least another 10,000 Euros just by reaching the Final of the Red Bull Salute, had another opportunity with the two-man advantage on the power play in the second period, also, but were again frustrated by the work of both Rautio and the HF Lulea defense. The very best chance for BK Farjestad Karlstad to level occurred roughly five and a half minutes into the third period when Rautio was finally beaten by the rising shot of veteran RICKARD WALLIN, who previously contested 79 NHL games (79 ga, 8 go, 19 pts) for the Minnesota Wild and Toronto Maple Leafs in his career. But the puck clanked off the iron and away to safety, as far as HF Lulea was concerned at least. So, no luck for the 32-year-old center who has represented Sweden at the annual IIHF World Championships on five occasions (45 ga, 6 go, 14 pts), then. A goaltending mistake essentially ended the contest in HF Lulea’s favor once and for all with just under seven minutes remaining to be played. Ironically enough, the normal first string netminder for BK Farjestad Karlstad, ALEXANDER SALAK, was on duty for the national team of the Czech Republic at the Channel One Cup (old Izvestia Trophy) in Russia and unavailable for the Red Bull Salute tournament. And so Vihko, who has scored just two goals in 31 Swedish Elitserien matches for HF Lulea this 2012/13 season, was gifted a second goal when BK Farjestad’s reserve shot-stopper FREDERIK PETTERSSON-WENTZEL bascially gave the puck right to the Finnish import by virtue of careless play. HF Lulea defenseman ROBIN JONSSON, the 29-year-old veteran who was selected in the fourth round (# 120 overall) by the St. Louis Blues at the 2002 NHL Draft, and BK Farjestad Karlstad MARIUS HOLTET (12), the 28-year-old right wing who was drafted in the second round (# 42 overall) at that same 2002 NHL Draft and has appeared with the national team of Norway at seven major international events (37 ga, 11 go, 18 pts) in his career, mix it up during the Final of the 2012 Red Bull Salute – European Trophy at the Slovnaft Arena in Bratislava, Slovakia. HF Lulea trainer JONAS RONNQVIST chose Rautio, who normally plays second-fiddle for HF Lulea in the Elitserien to the talented youngster JOHAN GUSTAFSSON, to start the Red Bull Salute Final in Bratislava and would not regret that decision one bit; overall, BK Farjestad Karlstad would go on to outshoot their Swedish elite league rivals by the margin of 35-28 but Rautio proved himself equal to every task and had the good fortune, to boot. Rautio was awarded one star by tournament officials for his performance in the Final at Bratislava. 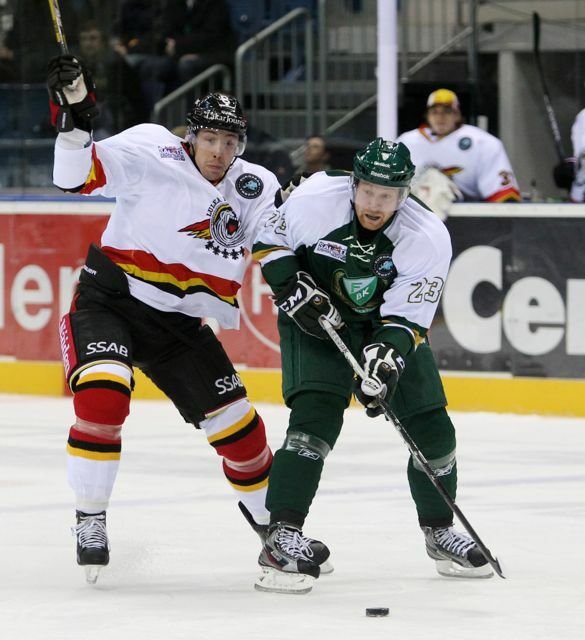 BK Farjestad Karlstad’s Canadian legionnaire CHRIS LEE, the 32-year-old who was chosen as the best defenseman in the Deutsche Eishockey Liga for Adler Mannheim last season, was awarded two stars by the powers that be. Not surprising, the two-goal Vihko was given three stars as the game’s most valuable player. MIKO PYORALA, the Finnish import who skated 36 NHL contests for the Philadelphia Flyers (2 go, 4 pts) during the 2009/10 campaign, proved himself to be a nice addition for HF Lulea after signing from Russian club Amur Khabarovsk (25 ga, 5 go, 10 pts) of the Kontinental Hockey League in mid-November. The 31-year-old left wing is, of course, well-experienced having represented Finland at five IIHF World Championships (41 ga, 3 go, 8 pts). Pyorala, who has recorded two goals and five points in ten Elitserien contests this term, notched a huge strike for HF Lulea in the Red Bull Salute quarterfinal contest against Swedish side IF Brynas Galve at the Albert Schultz Halle in Vienna, Austria. Finnish import JOONAS VIHKO (20, center), the former IFK Helsinki, Saipa Lappenranta and HPK Hameenlinna skater who finished with four goals and six in ten European Trophy contests this season — including three goals at the 2012 Red Bull Salute tournament — receives hearty congratuations from his HF Lulea teammates after lighting the lamp at the Slovnaft Arena in Bratislava, Slovakia, as BK Farjestad Karlstad reserve netminder FREDERIK PETTERSSON-WENTZEL (background) stands dejected during the Final of 2012 Red Bull Salute – Euorpean Trophy competition. UPC Vienna Capitals’ highly-experienced defenseman ANDRE LAKOS (64), the 33-year-old rearguard who has represented Austria at nine major international tournaments (52 ga, 7 go, 15 pts) including the 2002 Winter Olympic Games in his career, battles for the puck along the boards with Eisbaeren Berlin center T.J. MULOCK (15), the 27-year-old veteran of Germany’s 2010 Olympic squad who ranked second among all players with 12 points in the qualification round of the European Trophy competition, during the quarterfinal match of the 2012 RED BULL SALUTE – EUROPEAN TROPHY FINALS contested at the Albert Schultz Halle in Vienna. A controversial goal late in the second period and a power play strike in overtime for the home side canceled out a courageous rally pulled off by the guests in the third period as surprising Austrian side UPC VIENNA CAPITALS defeated two-time defending German champion EISBAEREN BERLIN in overtime 3-2 at the quarterfinal stage of the RED BULL SALUTE – EUROPEAN TROPHY FINALS. UPC Vienna Capitals’ seasoned Canadian legionnaire FRANCOIS FORTIER (15), the 33-year-old left wing who spent eight seasons in Germany’s Deutsche Eishockey Liga primarily with the Hamburg Freezers before leaving for Austria in the summer of 2010, eludes a pair of would-be checkers from Eisbaeren Berlin during the closely-contested quarterfinal match of the 2012 Red Bull Salute – European Trophy staged at the Albert Schultz Halle. From the very first drop of the puck, the host Austrian side UPC VIENNA CAPITALS, the current leaders in the Erste Bank Eishockey Liga, came right at their German guests EISBAEREN BERLIN, the two-time defending champion of the Deutsche Eishockey Liga who won the inauguaral edition of the European Trophy with their triumph at the Red Bull Salute final tournament in early September of 2010, with a great deal of both commitment and energy in front of their home fans at the Albert Schultz Halle. Swedish import MARCUS OLSSON, Canadian legionnaire JOSH SOARES and the aging, former National Hockey Leaguer BENOIT GRATTON all had excellent opportunities in the first period to get their name on the scoresheet in the first period for UPC Vienna Capitals but would be stopped by Eisbaeren Berlin’s Germany national team goaltender ROB ZEPP. The flow of play in a penalty-filled opening session was, for the most part, discernably going in that of the home side’s favor. It was not until roughly five minutes remained until the first intermission when Eisbaeren Berlin finally enjoyed a high-quality scoring chance, but star Canadian legionnaire DANNY BRIERE fired wide from prime real estate between the two faceoff circles. Officially speaking, the home side skating in front of passionate supporters at the Albert Schultz Halle ended up with a 13-9 edge in the shots-on-goal category for a first period which saw eight penalties evenly divided between the two teams, as well. Eisbaeren Berlin’s star Canadian legionnaire DANNY BRIERE, the exiled Philadelphia Flyers right wing who was making his debut in the 2012 European Trophy tournament since having fled the National Hockey League’s “Lock-Out” situation in North America, is confronted by Swedish import MARCUS OLSSON of the UPC Vienna Capitals, the summer signing from Norwegian club IK Sparta Sarpsborg who ranks third on the Austrian club with eleven goals in all competitions this term, during the quarterfinal match of the 2012 Red Bull Salute – European Trophy Final held at the Albert Schultz Halle. Swedish trainer TOMMY SAMMUELSSON’s side continued hustle and skate hard after the first intermission. But Eisbaeren Berlin, who fell in overtime in their last domestic match before heading to Vienna for the Red Bull Salute tournament, also came into the contest a little more, for their part, in the middle frame Albert Schultz Halle. American trainer DON JACKSON’s team, however, did very little with the power play time it was awarded after the 35-year-old Gratton, who led UPC Vienna Capitals in scoring with 35 points (12 goals) from 37 games in all competitons going into the 2012 Red Bull Salute – European Trophy Finals, was assessed a double-minor for high-sticking at the 7:46 mark of the second period. In fact, Eisbaeren Berlin shot themselves in the foot and wiped out two minutes of that man-advantage situation when Germany Olympic veteran T.J. MULOCK, the 27-year-old center who paced Jackson’s club in scoring with 40 points (12 goals) from 34 games in all competitions this season entering the 2012 Red Bull Salute – European Trophy Finals, was escorted to the sin bin on a hooking charge exactly thirty seconds past the halfway point of the quarterfinal engagement. The visitors were able to effectively able to kill off the penalty when American import JIMMY SHARROW, the Eisbaeren Berlin rearguard who headed into the Red Bull Salute – European Trophy Finals having led all defensemen with five goals scored in the qualification round, was sent off for hooking at the 36:21 mark of the quarterfinal match at the Albert Schultz Halle. As for the contest, itself, this particular occasion was shaping up to be the quintessential ‘goaltenders’ duel’ as the time continued to tick towards the second intermission. UPC Capitals Vienna’s imported American DAN BJORNLIE (28), the former University of Wisconsin defenseman who signed to skate at the Albert Schultz Halle in the summer of 2007 after spending most of his five seasons of German professonal hockey in the 2.Bundesliga, stands ready as the puck flies towards Canadian legionnaire MATT ZABA, the former Colorado College netminder who was chosen in the eighth round (# 231 overall) of the 2003 NHL Draft by the current Stanley Cup champion Los Angeles Kings. Eisbaeren Berlin goaltender ROB ZEPP, the native Canadian who was chosen in the fourth round (# 99 overall) of the 1999 National Hockey League Draft by the Atlanta Thrashers and then picked, once again in the fourth round (# 110 overall), at the 2001 NHL Draft by the Carolina Hurricanes, had a stellar qualification round in the 2012 European Trophy tournament; Zepp appeared in six contests (1.50 avg) while turning aside 203 of 212 shots faced for a sparkling .958 save percentage and registered shutouts in his last two matches against Finnish side Karpat Oulu and Swedish club HF Lulea. But suddenly, just twenty-three seconds after Sharrow had been released from the penalty box, the controversial moment which changed the entire complexion of the tense quarterfinal manifested itself quite literally out of nowhere. American import DAVID LUNDBOHM, the former University of North Dakota winger who is skating with his third club this 2012/13 season after being sent out on loan by Swedish second division club IK Vasteras, still has not registered a point for UPC Vienna Capitals in ten Erste Bank Eishockey Liga contests this term since arriving from Finnish second division club Tu To Turku. But the 32-year-old journeyman, who spent the 2005/06 campaign with the Providence Bruins (72 ga, 17 go, 45 pts) in the American Hockey League and the following year with the Straubing Tigers (51 ga, 10 go, 26 pts) in the Deutsche Eishockey Liga before moving on to Nationalliga B side SC Langenthal in Switzerland, sent a seemingly harmless-enough puck towards the front of the net. 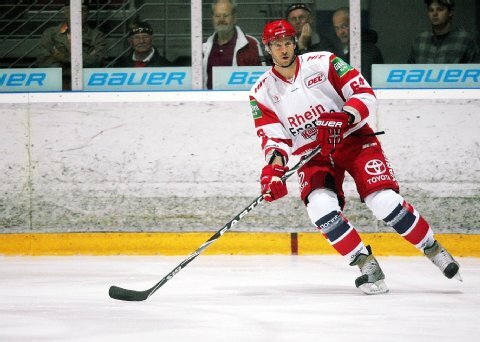 Meanwhile, Soares, the former University of Maine left wing who spent the 2009/10 season in the German D.E.L. with the Kassel Huskies (56 ga, 16 go, 56 pts) before transferring to Swedish club HC Vaxjo Lakers, was standing in front of the net and the little black disc somehow re-directed itself behind Zepp and into the Eisbaeren Berlin net. It certainly appeared to be the sort of splendid back-heel strike that any professional footballer in Europe worth his salt would have been proud of. The Swedish match referees ULF RONNMARK and MARCUS VINNERBORG dutifully consulted with the video equipment at the bench area and then, astonishingly enough, awarded UPC Vienna Capitals a pivotal goal with just 1:16 left in the second period. UPC Vienna Capitals’ Canadian legionnaire JOSH SOARES and American import DAVID LUNDBOHM (68) celebrate in front of the Eisbaeren Berlin net after scoring the all-important first goal of the quarterfinal match during the Red Bull Salute – European Trophy Finals contest at the Albert Schultz Halle. Although the shots-on-goal had been relatively even (23-22 in favor of UPC Vienna Capitals) over the first forty minutes at the Albert Schultz Halle, it was now the visiting Eisbaeren Berlin who were left to chase the game when the two clubs emerged for the final period. The visitors got yet another power play when UPC Vienna Capitals left winger ZDENEK BLATNY, the 31-year-old import from the Czech Republic who once skated 25 NHL games (3 go, 0 as) for the Atlanta Thrashers and Boston Bruins, went to the penalty box for hooking only 1:56 into the final frame. Once again, however, organized and disciplined defending from the home side as well as continued ineffectiveness with the man-advantage by the guests saw another golden chance go by the boards. Now forced to press their attack, Eisbaeren Berlin lost control of the puck along the boards in defensive zone to the NHL veteran Gratton and the 35-year-old Montreal native made the visitors pay dearly. An immediate and accurate pass found DANIEL WOGER, the 24-year-old summer signing from Graz 99ers who has appeared in just 13 of 30 Erste Bank Eishockey Liga contests and boasts all of a solitary assist this term, in the slot. Woger, with all the accurancy of a genuine Torjaeger, though, snapped a wrister just over the glove of Zepp and into the upper corner of the net to score his very first goal of the season a little over six minutes in. With the 2-0 advantage at their back, the UPC Vienna Capitals and their boisterous supporters could now smell the upset victory … not that the guests were prepared to merely pack up and go straight back to Germany, though. Eisbaeren Berlin right wing LAURIN BRAUN (12), the youngster who previously scored a goal for the German capital city club in the 5-3 triumph over Swedish side HV 71 Jonkoping in the ultimate match at the 2010 Red Bull Salute – European Trophy Finals, was instrumental in sparking a third period rally against hard-hitting UPC Vienna Capitals in the quarterfinal match of the 2012 Red Bull Salute – European Trophy Finals contested at the Albert Schultz Halle in the capital city of Austria. Indeed, Eisbaeren Berlin responded quickly and halved the deficit less than a sixty seconds later. Canadian legionnaire JAMIE ARNIEL, the 23-year-old who spent the last three seasons skating for the Providence Bruins in the American Hockey League before signing with the two-time defending D.E.L. champions this past summer, moved the puck ahead for LAURIN BRAUN on the rush. A fabulous centering pass from the 21-year-old right wing found MADS CHRISTENSEN all alone at the far left post and an effective finish from the Denmark international gave the guests brand new life. A second goal in as many games for the suddenly in-form Christensen, who also netted for Eisbaeren Berlin in their last domestic match opposite his old club Iserlohn Roosters, as well; the up-lifting tally was also a second strike in this 2012 European Trophy tournament (9 ga, 2 go, 6 pts) for the 25-year-old Danish import, who has recorded just three goals and six points in 21 D.E.L. games for the reigning German titlists this term. Eisbaeren Berlin center MADS CHRISTENSEN (60), the Denmark international who totaled 10 goals and 26 points from 51 games in all competitions for the German capital city club last season, scored a massive third period goal against host UPC Vienna Capitals during the quarterfinal match of the 2012 Red Bull Salute – European Trophy Finals held at the Albert Schultz Halle. Eisbaeren Berlin would completely dominate the last ten minutes of the quarterfinal match at the Albert Schultz Halle, but UPC Vienna Capitals’ Canadian legionnaire goaltender MATT ZABA, who was inked to a contract by the Austrian capital city club this past summer after capturing the Italian Serie A title with HC Bolzano last season, was busy proving himself to be an entirely different netminder than the one who had posted a save percentage of .874 from five appearances (3.26 avg) in the European Trophy qualification round earlier this term in the late summer and fall. Eisbaeren Berlin’s Canadian legionnaire DARIN OLVER (40), the native of Burnaby, British Columbia who was taken in the second round pick (# 36 overall) by the New York Rangers at the 2004 National Hockey League Draft but never played professional hockey in North America, is halted by the Vienna Capitals’ Canadian legionnaire netminder MATT ZABA (1), the native of Yorkton, Saskatchewan, who made one appearance (3.53 avg) for the New York Rangers during the 2009/10 NHL campaign before signing with Italian club HC Bolzano at the conclusion of that season, during the dramatic Red Bull Salute quarterfinal match at the Albert Schultz Halle in the capital city of Austria. Eisbaeren Berlin continued to desperately search for an equalizer and would go on to outshoot UPC Vienna Capitals by the wide margin of 17-7 in the third period but were continuously frustrated by the in-form Zaba. The hosts clearly adopted all-out defensive tactics, as well, and were caught icing the puck on several occasions after Christensen’s goal before the guests called time out with 1:48 to go. The American trainer Jackson had no real alternative, then, at the Berlin bench — Eisbaeren were forced to pull their goaltender in lieu of an extra skater. Eisbaeren Berlin were rewarded for their risk-taking when a wild scramble for the puck materialized with less than a minute to play. 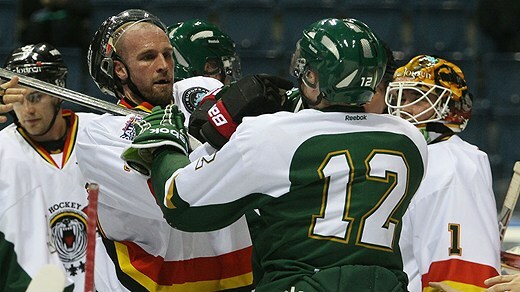 Canadian legionnaire DARIN OLVER, the former Northern Michigan University center who has only played nine matches (4 go, 8 pts) in the Deutsche Eishockey Liga this 2012/13 campagin on account of a crippling hip injury suffered earlier, was on hand to bulge the back of the net for the visitors. A first goal on Olver’s first appearance in the European Trophy tournament all season long dramatically brought the visitors level 2-2 with just 47 seconds left in the contest. And so, unlike the other three quarterfinal matches at this 2012 Red Bull Salute – European Trophy Finals tournament co-hosted by Bratislava and Vienna, this one matter in Austria between the current Erste Bank Eishockey Liga leaders and the visiting club who have won the German title six times in the last eight years would require overtime to settle. Eisbaeren Berlin leading scorer T.J. MULOCK (15) looks for a shot to come in the direction of UPC Vienna Capitals’ Canadian legionnaire MATT ZABA, the one-time New York Rangers goaltender who would finish with 37 saves and be formally selected as the most valuable player of the Austro-German contest by tournament officials, during the dramatic quarterfinal match of the 2012 Red Bull Salute – European Trophy Finals held at the Albert Schultz Halle in Austria. The hosts got a huge break in overtime when the Swedish match referees decided to penalize Eisbaeren Berlin blueliner CONSTANTIN BRAUN, the sixth round pick (# 164 overall) at the 2006 NHL Draft of the Los Angeles Kings, off for hooking Olsson, the 26-year-old UPC Vienna Capitals center who hails, of course, from Sweden … it was a questionable call to make, in the opinion of some, at the 1:48 mark of extra-time but there it stood. With overtime already being a four-on-four situation, Eisbaeren Berlin were, thus, required to defend shorthanded with just three skaters. It was, ironically enough, a fourth shot of the extra session that did the trick for the UPC Vienna Capitals, then. There was nothing the triangular trio of the visitors — Christensen, Sharrow and defenseman JENS BAXMANN — could do to prevent the decisive point shot from getting through traffic to elude Zepp, who ended the riveting contest with 31 saves. So it was the veteran Austria international ANDRE LAKOS, the 33-year-old defenseman who has skated for clubs in Canada, Germany, Russia, Sweden as well as the United States over the course of his long and well-traveled career, who became a real big hero with his overtime goal for the hometown UPC Vienna Capitals in the 2012 Red Bull Salute – European Trophy Finals quarterfinal match witnessed by 4,950 spectators at the Albert Schultz Halle. Austria international defenseman ANDRE LAKOS (64), the third round choice (# 95 overall) of the New Jersey Devils at the 1999 National Hockey League Draft who spent two and a half seasons skating with the Albany River Rats in the American Hockey League several years ago, appeared in 27 Deutsche Eishockey Liga contests (2 go, 14 pts) for Koelner Haie before transferring to UPC Vienna Capitals in January of 2012. Could Claude Giroux Have Been Game-Changer At Red Bull Salute? This was the title to the on-line piece published by the BERLINER KURIER on December 10, 2012, just three days before Eisbaeren Berlin’s quarterfinal match with host UPC Vienna Capitals in the Red Bull Salute – European Trophy Final tournament. This was in reference to the the fact that the Philadelphia Flyers star CLAUDE GIROUX was not present in the capital city of Germany, but, ironically enough, could be found in that of Canada. The report also detailed that the 24-year-old center had resumed his training in Ottawa a little while ago instead of rejoining Eisbaeren Berlin. The reason for this stated was that Giroux had been that hoping the National Hockey League’s on-going labor dispute would soon be coming to an end. The main source for the Berliner Kurier article was none other than Eisbaeren Berlin general manager PETER JOHN LEE, himself, who declared that he is in constant contact with Giroux’s agent. The conclusion of the piece? Only if the National Hockey League season is formally canceled once and for all will the third leading scorer in all the NHL last season be returning to Eisbaeren Berlin in Germany. This blog has been quietly of that opinion for quite some time now, but that would be another story. And, of course, the NHL had already had its round of games thru December 14th canceled some time ago with no realistic and speedy end to the labor dispute anywhere near in sight. But, whatever, as Giroux was never expected to appear at the Red Bull Salute – European Trophy Final, anyway. Eisbaeren Berlin’s star Canadian legionnaire CLAUDE GIROUX (28), the exiled Philadelphia Flyers center who had a huge assist for two-time defending Deutsche Eishockey Liga champion to greatly facilitate the monster triumph in the very last match of the European Trophy qualifying stage, chases down an opposing HF Lulea player during the international tournament contest at the Copp Arena in northern Sweden earlier this season. It is a fact that Giroux had a great deal to do with Eisbaeren Berlin actually getting to the Red Bull Salute tournament, itself. For, indeed, it was the NHL star who had a huge helper on the go-ahead goal by Germany national team defenseman CONSTANTIN BRAUN for Eisbaeren Berlin in a critical European Trophy qualifying match against powerful Elitserien side HF Lulea away in Sweden. And so this significant contribution from the explosive Canadian must be remembered as well as sincerely respected. Giroux, to review, compiled four goals and 20 points in just ten matches from all competitions for Eisbaeren this season before receiving a shot to the side of the neck in a D.E.L. contest against the visiting Krefeld Pinguine at the O2 World Arena Berlin back on November 16. With the benefit of hindsight, it is easier than ever to state that Eisbaeren Berlin could have probably used the services of the Philadelphia Flyers star center in the two-time defending German champion’s heart-breaking, overtime loss to the host UPC Vienna Capitals at the quarterfinal stage of the Red Bull Salute – European Trophy Final tournament. Even without Giroux, there is also little doubt that Eisbaeren Berlin might have done better than to score just two goals against UPC Vienna Capitals at the Albert Schultz Halle in the capital city of Austria. Particularly considering, the German guests would outshoot their opponents by the margin of 39-30 in regulation time. There is also no doubt that American trainer DON JACKSON’s club had ample opportunities with the power play but yet still had tremendous difficulty putting the puck in the Austrians’ net, nevertheless. Has Canadian star CLAUDE GIROUX, the locked-out Philadelphia Flyers center who finished third in the entire 30-team National Hockey League with 93 points (28 goals) last season, already worn the sweater of two-time defending Deutsche Eishockey Liga champion EISBAEREN BERLIN for the very last time or will the dynamic offensive threat be returning to the capital city of Germany at some point this season? Eisbaeren Berlin’s star Canadian legionnaire DANNY BRIERE (84), the experienced, 35-year-old veteran right wing who is currently tied for fifth place on the Deutsche Eishockey Liga scoring chart with 27 points despite missing the first nine games of the German domestic season, headlines a mixed cast of National Hockey League refugees who are expected to compete for their respective clubs at the RED BULL SALUTE tournament to be jointly hosted by the Slovakian city of Bratislava and the Austria city of Vienna. Denmark international JANNIK HANSEN (36) of Finnish elite league club Tappara Tampere, the 26-year-old right wing who skated in all 82 NHL games for the Vancouver Canucks last season and posted career highs of 16 goals and 39 points after appearing in the prestigous Stanley Cup finals for the western Canadian club the year before, has totaled five goals and 12 points in 14 Suomi-Liiga contests since crossing the Atlantic Ocean earlier this fall. Slovan Bratislava defenseman ANDREJ SEKERA (44), the exiled Buffalo Sabres blueliner who had gave such a standout performance for silver medalist Slovakia (10 ga, 2 go, 9 pts) at the 2012 IIHF World Championships in Scandinavia last spring, emerges from behind his own net with the puck during the Kontinental Hockey League match against Russian club Metallurg Novokuznetsk earlier this season. Make that five “victims” of the National Hockey League’s “Lock-Out” situation who can be expected to skate at the RED BULL SALUTE – EUROPEAN TROPHY FINALS, which begin with the quarterfinal matches on December 13. Sitting down to write the VIENNA CAPITALS scouting report tonight, the blog has learned that defenseman COREY POTTER, the NHL refugee of the Edmonton Oilers, decided not to extend his stay in Austria and left Swedish trainer Tommy Samuelsson’s team at the beginning of December. Considering this blog is decidedly pro-Eisbaeren Berlin, this Potter development can be seen as nothing but a very pleasant surprise! It always looked to be a daunting task for the two-time defending German champion, then. A long trip to northern Sweden followed by a vital European Trophy away match against an unbeaten opponent who are currently skating second in the crack Elitserien. The impossible mission at hand was crystal clear — in order to qualify for the Red Bull Salute final tournament, visiting EISBAEREN BERLIN would need to return with at least one point at the expense of formidable host HF LULEA. 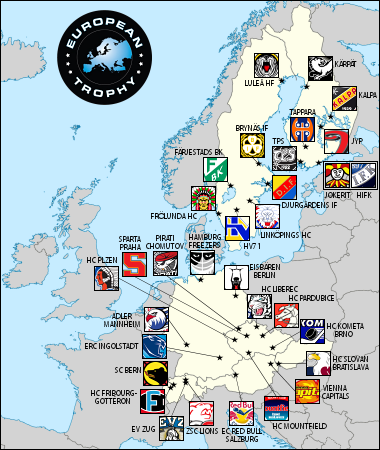 HF Lulea, who were originally founded in 1977, are the second-youngest club currently competing in the 12-team Swedish elite league but have been a regular fixture in the top flight ever since the 1984/85 campaign and celebrated the club’s one and only Elitserien title to date at the end of the 1995/96 season. 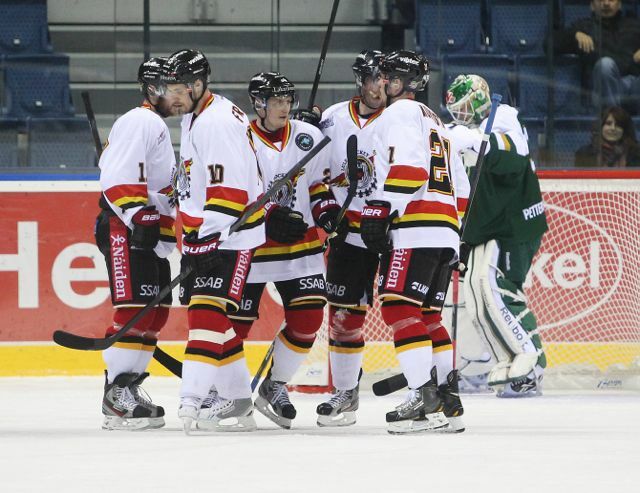 Last season, the northern side finished in first place at the end of the Elitserien regular season but would be eliminated at the quarterfinal stage of the playoffs. 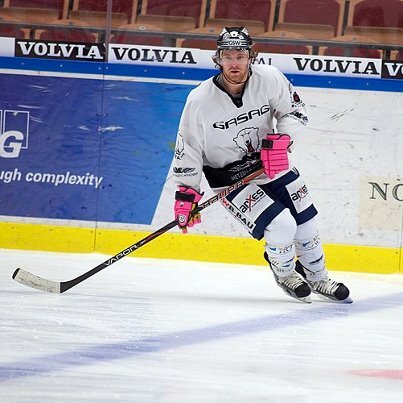 HF Lulea are trained by one of its former players in JONAS RONNQVIST, the 39-year-old former Sweden international left wing who previously skated in 38 games (0 go, 4 pts) for the Anaheim Mighty Ducks during the 2000/01 National Hockey League season and, only a few years later, was forced to retire early on account of injury. Ronnqvist’s squad, which won all seven of its European Trophy contests heading into the home match with visiting Eisbaeren Berlin, is not exactly loaded with Sweden national team players but does boast two former NHL skaters and eight others who were drafted at some point by NHL teams. Eisbaeren Berlin’s star Canadian legionnaire CLAUDE GIROUX (28), who scored three goals and added six assists for nine points in his first four games in the Deutsche Eishockey Liga, was unexpectedly forced to make his professional debut in Sweden sans his National Hockey League sidekick from the Philadelphia Flyers, high-scoring right wing DANNY BRIERE. 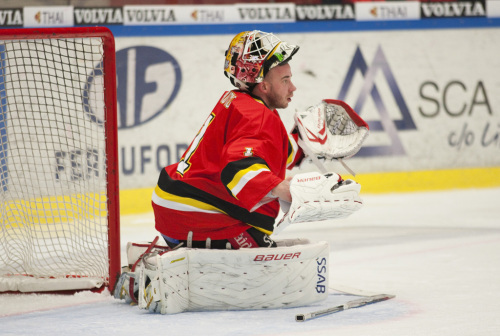 Furthermore, HF Lulea were able to send out a full compliment of 22 players in uniform, including the two goaltenders, for the critical contest in the European Trophy’s North Division. However, American trainer DON JACKSON only had 19 men available to don the sweaters for visiting Eisbaeren Berlin. This because one of the German capital city club’s two exiled NHL superstars, DANNY BRIERE, came down with a cold after graciously consenting to a lengthy press conference put on by the welcoming Swedish media upon the pair’s arrival in country. Aside from Briere, the visitors were also without their captain for the big European Trophy clash with host HF Lulea as Eisbaeren Berlin captain ANDRE RANKEL, the Germany national team winger who had a goal and two assists in the preceding rout of Iserlohn Roosters just two days earlier, was out with a minor injury. Perhaps it was the gravity of the circumstances or maybe it was just the overall quality of the Swedish Elitserien opponents. Whatever the case, for the very first time since the two locked-out Philadelphia Flyers began appearing with Eisbaeren Berlin in the Deutsche Eishockey Liga, Jackson dressed six natural defensemen for the crucial match with HF Lulea. The D.E.L.’s four-game suspension recently issued to Canadian legionnaire MARK KATIC (who leads all defensemen in the 32-team European Trophy with nine points) does not apply to international tournament, of course. Defenseman HENRY HAASE, the 20-year-old who skated in all seven of Eisbaeren Berlin’s contests in the European Trophy earlier this season, regained his place in the trainer Jackson’s team and, in fact, made his first appearance in uniform since the highly-publicized signing of the talented Philadelphia Flyers pair. Eisbaeren Berlin’s imported American blueliner JIMMY SHARROW (3), who continues to lead all defenseman in the entire European Trophy tournament with five goals for the German capital city club, keeps an eye on both the puck and HF Lulea winger LINUS KLASEN (86), the undrafted 26-year-old who scored 22 goals (45 points) in 47 American Hockey League games for the Milwaukee Admirals and also made four appearances (0 go, 0 pts) in the NHL for the Nashville Predators two seasons ago, during the European Trophy contest at the Copp Arena in northern Sweden … reportedly, Klasen has a contract with HF Lulea which is actually being paid out by previous employers IF Malmo Redhawks but still earns the winger a salary of 4.0 million Swedish Krona (roughly $ 594,790 today in the United States) per year and that is the most lucrative deal in all the land. HF Lulea happen to have two standout shot-stoppers on the roster at the moment who have been splitting time equally in both the European Trophy and Elitserien competitions this season. 20-year-old JOHAN GUSTAFSSON was selected in the sixth round (# 159 overall) of the 2010 National Hockey League Draft by the Minnesota Wild and, last winter, appeared in five games (2.20 avg) for the Sweden side which won the gold medal at the 2012 IIHF World Junior Championships in the western Canadian province of Alberta. 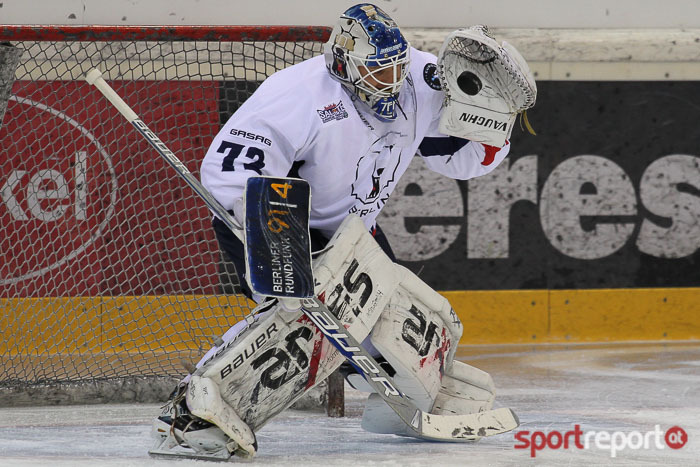 For the European Trophy contest with visiting Eisbaeren Berlin, though, the trainer Ronnqvist chose experience and named 27-year-old DAVID RAUTIO as his starting netminder. Eisbaeren Berlin, as could be expected, went with Germany national team veteran ROB ZEPP, the 31-year-old native Canadian and two-time National Hockey League draft pick who has seen his goals-against-average in the D.E.L. balloon this term but does have four Deutsche Eishockey Liga titles to his credit and also backstopped the capital city club to the Red Bull Salute title in 2010. And so, the classic goaltending duel / defensive struggle was all set to get underway at the Copp Arena in northern Sweden. A solitary hockey fan sits comfortably behind the net defended by HF Lulea starting goaltender DAVID RAUTIO (1), who appeared in four games (3.95 avg) for Sweden at the 2005 IIHF World Junior Championships held in the United States, during the critical European Trophy contest featuring visiting reigning German champion Eisbaeren Berlin at the Copp Arena in northern Sweden. The opening period was very closely-contested, to be certain, with both teams generating a combined total of just nine shots on target for the whole of the first twenty-minute session. Eisbaeren Berlin, as one might imagine, were hoping for a bit of magic from star Canadian legionnaire CLAUDE GIROUX, the creative, 24-year-old center whose 93 points (28 goals) for the Philadelphia Flyers was third-highest total in the entire 30-team National Hockey League last season. HF Lulea, on the other hand, boasted five NHL draft picks on the blueline who were more than happy to test their mettle against Eisbaeren’s world-class player. HF Lulea defenseman JOHAN FRANSSON (10), the 2nd round selection (# 34 overall) of the Dallas Stars at the 2004 National Hockey League Draft who represented Sweden at both the 2004 and 2005 IIHF World Junior Championships, fires a low puck in on the Eisbaeren Berlin net guarded by Germany national team goaltender ROB ZEPP during the decisive but certainly low-scoring European Trophy contest at the Copp Arena. The scoreless stalemate continued long after the first intermission at the Copp Arena ended, as well. Understrength Eisbaeren Berlin, despite having three fewer skaters on the bench, not only held their own but definitely had at least as much of the play in the second period, as evidenced by the official 9-6 statistic (according to the website of the European Trophy) in the influential shots-on-goal department. Finally, with little more than than four minutes remaining until the Zamboni came out to clean the ice for a second time that evening, the 70 or so Eisbaeren Berlin fans who had made the long journey from the German capital got the very thing they had come so far to see. HF Lulea defenseman LUKAS KILSTROM (5), the 22-year-old who appeared in all six games for bronze medalist Sweden at the 2010 IIHF World Junior Championships hosted by the western Canadian province of Saskatchewan, seeks to confront Eisbaeren Berlin’s star Canadian legionnaire CLAUDE GIROUX (28) along the boards during the critical European Trophy contest at the Copp Arena in northern Scandinavia. The nimble Giroux made a nifty play to get the puck to Germany national team defenseman CONSTANTIN BRAUN, the sixth round pick (# 164 overall) at the 2006 NHL Draft by the current Stanley Cup champion Los Angeles Kings. A big blast from the blue line by the 24-year-old rearguard, playing just his third competitive match after returning from injury, beat HF Lulea goaltender DAVID RAUTIO and caught the top corner of the net to give Eisbaeren Berlin an enormous 1-0 lead at the 35:51 mark of the big European Trophy match. A clutch second goal in as many contests for the experienced Braun, then. HF Lulea defenseman JAN SANDSTROM (7), the 34-year-old veteran who was tabbed in the sixth round (# 173 overall) of the 1999 National Hockey League Draft by the Anaheim Mighty Ducks but never did try his hand at professional hockey in North America, prepares to fish the puck out of the net as Eisbaeren Berlin forward T.J. MULOCK (15), the 2010 Germany Olympic squad veteran who currently ranks second in scoring for this European Trophy tournament with 12 points, is about to join goal-scorer Constantin Braun and the rest of his teammates at the Copp Arena in Sweden. HF Lulea netminder DAVID RAUTIO (1), the seasoned 27-year-old whose sparkling 1.23 goal-against-average (eight games) leads all shot-stoppers in the crack Swedish Elitserien this term, gestures after giving up a late second period strike during the important European Trophy contest with visiting Eisbaeren Berlin at the Copp Arena. Germany national team defenseman CONSTANTIN BRAUN (center) is jubilant after scoring the go-ahead goal for visiting Eisbaeren Berlin late in the second period of the critical North Division contest with host HF Lulea at the Copp Arena in northern Sweden; joining in the well-earned celebration are Canadian superstar CLAUDE GIROUX (28), who collected an assist on his debut in the 2012 Euroepan Trophy tournament, youthful defenseman THOMAS SUPIS (6) as well as Eisbaeren assistant captain T.J. MULOCK (A). In some respects, the visitors’ work had just begun — particularly after Eisbaeren Berlin’s veteran Germany national team defenseman FRANK HOERDLER was sent off for hooking at 19:28 of the second period. But, as was the case when Denmark international MADS CHRISTENSEN was put in the penalty box at the beginning of the middle frame, HF Lulea did not not muster much of a threat on the ensuing power play. The visitors, it should be noted, played a very disciplined game in Sweden and took only two minor penalties in the do-or-die European Trophy encounter. HF Lulea center KIM HIRSCHOVITS (44), the 30-year-old veteran who was selected by the New York Rangers in the sixth round (# 194 overall) of the 2002 National Hockey League Draft, gets his stick up high on visiting goaltender ROB ZEPP (72) as Eisbaeren Berlin defenseman JENS BAXMANN (29) struggles to control the Swedish attacker from behind during the pivotal European Trophy match at the Copp Arena. HF Lulea applied a tremendous amount of pressure in the third and final period but were unable to break down the Berlin defensive wall. Ronnqvist’s charges thoroughly controlled the traffic and went on to enjoy a 10-3 advantage in the shots-on-goal category but could not successfully solve the in-form Eisbaeren netminder. Zepp, who also posted a shutout in the German capital city club’s last European Trophy match against visiting Finnish side Karpat Oulu at the O2 World Arena Berlin in early September, wound up with 21 saves and a clean sheet on his evening in front of 4,235 mostly-Swedish spectators at the Copp Arena. Giroux, meanwhile, might have sewn the match up once and for all when the NHL superstar found himself all alone in front of the net with just two and half minutes remaining on the clock but the determined Rautio had other ideas about surrender … the exiled Philadelphia Flyers center would, though, have a huge impact on the play that did turn the lights out for HF Lulea. After Eisbaeren Berlin iced the puck at the 17:56 mark of the third period, the Swedish trainer Ronnqvist called for timeout to organize the HF Lulea attack — and exchange the goaltender with a sixth skater for the offensive zone draw. Giroux was able to win that vital faceoff in the defensive third, however, and soon both Germany Olympic veteran T.J. MULOCK and Hoerdler had worked the puck to Canadian legionnaire JULIAN TALBOT in the neutral zone. The seasoned 27-year-old forward, who tallied 21 goals in all competitions for Eisbaeren Berlin last season after leaving the Lake Erie Monsters of the American Hockey League in the summer of 2011, then shot the black disc into the empty net from behind the red line at center ice. 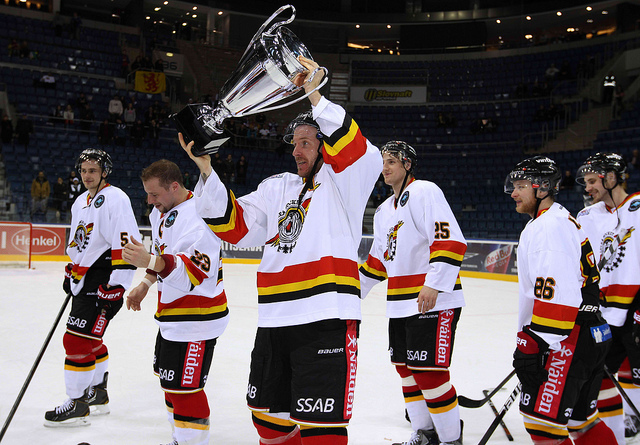 Talbot’s third goal of this European Trophy tournament formally punched the defending Detusche Eishockey Liga champion’s ticket to the Red Bull Salute. 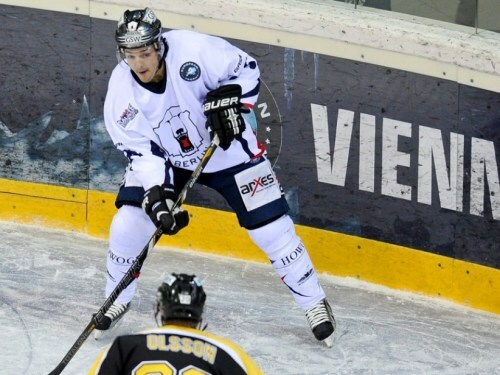 Fitting, then, that it was Talbot who had scored two goals in Eisbaeren Berlin’s 6-4 triumph over Czech Republic side HC Plzen to begin this 2012 European Trophy campaign. No one can really say for sure whether or not the ‘Lock-out’ situation that has currently paralyzed the National Hockey League on the other side of the Atlantic Ocean in North America will be resolved by mid-December. Nevertheless, newly-arrived NHL superstar CLAUDE GIROUX has already performed a great service to his new EISBAEREN BERLIN club by helping the team qualify for the Red Bull Salute final tournament with a standout effort in the European Trophy contest against host HF Lulea on the road in Sweden. Officially speaking, Giroux was selected as the game’s third star (the two HF Lulea defensemen, Johan Fransson and Lukas Kilstrom, were selected as the second and first stars, respectively). Canadian legionnaire JAMIE ARNIEL (9), the 23-year-old right wing who made exactly one appearance for the eventual Stanley Cup champion Boston Bruins during the 2010/11 National Hockey League campaign, celebrates his goal for Eisbaeren Berlin during the European Trophy contest opposite host EC Red Bull Salzburg earlier this past August at the Red Bull Arena in Austria. With visiting German team EISBAEREN BERLIN having shutout hosting Swedish club HF Lulea and the traveling Finnish outfit Jokerit Helsinki having fallen to Elitserien side BK FARJESTAD KARLSTAD on its journey to neighboring Sweden, the final two places for the European Trophy’s final tournament — the RED BULLS SALUTE — have now been officially determined. There are actually still five European Trophy preliminary round contests to be played in the month of November but nine of the ten teams involved in those undecided matches have already been mathematically eliminated and cannot advance to the Red Bulls Salute tournament. The much-anticipated Red Bulls Salute holiday ice hockey extravaganza will be held from this coming December 13th thru the 16th and is all set to be hosted jointly by the Austrian city of Vienna as well as the Slovakian city of Bratislava. Two other clubs, EISBAREN BERLIN (Germany) and IF BRYNAS GALVE (Sweden), qualified as the two division runners-up with the most points in the standings; two teams, UPC VIENNA CAPITALS (Austria) and HC SLOVAN BRATISLAVA (Slovakia), were always scheduled to be automatic entrants as co-hosts no matter where they would happen to finish in the actual European Trophy preliminary round standings. As, perhaps, one has already noticed, the 2012 Red Bulls Salute this coming December is guaranteed to have a serious Scandinavian flavor. No fewer than four Swedish teams — exactly half of the final tournament field — have advanced past the preliminary round of the European Trophy competition, with no less than three Elitserien clubs having won their respective divisions outright. 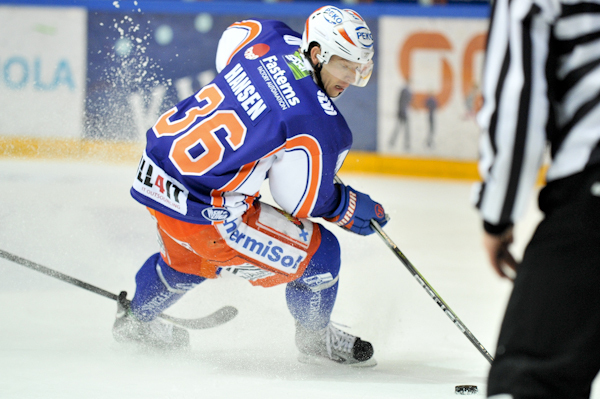 Furthermore, the Tappara Tampere side from Finland also finished first in its division race, as well. Eisbaeren Berlin’s Canadian legionnaire MARK KATIC, the German capital city club’s summer signing who spent most of the past three seasons skating for the Bridgeport Sound Tigers in the American Hockey League, currently leads all defensemen involved in the 32-team European Trophy tournament in scoring having posted nine points (three goals) after eight games. Eisbaeren Berlin’s Germany national team defenseman FRANK HOERDLER (7) tires to move Hamburg Freezers’s aging Canadian legionnaire SERGE AUBIN (10), the 37-year-old journeyman who skated 374 NHL games (44 go, 108 pts) for the Colorado Avalanche, Columbus Blue Jackets and Atlanta Thrashers before spending five seasons in Switzerland wtih HC Servette-Geneva and HC Fribourg-Gotteron, so that home side goaltender ROB ZEPP (72) might see better during the European Trophy contest at the O2 World Arena Berlin earlier this fall. 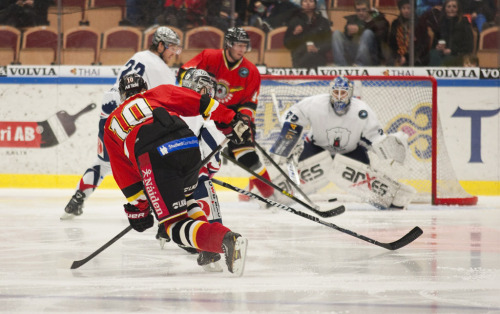 The EC RED BULL SALZBURG club has been hosting an invitational ice hockey tournament in Austria since the first installment was originally held in September of 2005. The National Hockey Leauge’s Los Angeles Kings, the reigning Stanley Cup champions, made the journey five years ago and triumphed at the Red Bull Salute affair that was staged in late September of 2007. This 2012 RED BULLS SALUTE will mark the third consecutive year that the ever-increasingly prestigious event will serve as the final tournament for the significant European Trophy competition. EISBAEREN BERLIN, of course, won the landmark Red Bulls Salute tournament two years ago at the beginning of September iin 2010 with consecutive victories over Finnish club TPS Turku (4-1), Swiss side SC Bern (5-1) and, in the Final, Swedish opponent H.V. 71 Jonkoeping (5-3); Eisbaern Berlin’s Canadian-born goaltender ROB ZEPP, who had made two impressive appearances (1.54 avg, 95.65 svpct) for Germany at the 2010 IIHF World Championships only a few months earlier, also did much to distiguished himself in all three matches (3 ga, 1.67 avg, .932 svpct) for the title-winning team that fall in Austrian Alps. Eisbaeren Berlin’s attack-minded defenseman MARK KATIC is denied at the side of the net by Karpat Oulu goaltender TOMI KARHUNEN, the 22-year-old who finished last season out on loan to HC Slovan Bratislava in Slovakia, as youthful center JOONAS HUOVINEN (12) anxiously chases the play for the visitors to the O2 World Arena during the pivotal European Trophy contest in the capital city of Germany. A first strike just 38 seconds into the contest and 37 saves from the national team goaltender enabled contemporary German powerhouse EISBAEREN BERLIN to register a critical 3-0 triumph over visiting Finnish club KARPAT OULU and recapture second place in the North Division of the 2012 European Trophy tournament. Third-year American defender JIMMY SHARROW netted the first of what would be his two goals in the match to effectively shock Karpat Oulu, the collectors of four Finnish domestic titles from 2004 thru 2008, right at the outset. And then Berlin’s new adventuresome rearguard, the diminutive but talented MARK KATIC, whacked a puck out of the air past visiting goaltender TOMI KARHUNEN with less than two minutes until the first intermission. Karpat Oulu, who ended seventh out of fourteen teams in the Finnish elite league last term, would go on to outshoot their hosts by a wide margin for the game but it was a futile effort. Trainer DON JACKSON, a rugged product of the University of Notre Dame who later skated 315 games for the Minnesota North Stars, Edmonton Oilers and New York Rangers in the National Hockey League and represented the United States at the annual IIHF World Championships in both 1978 (hosted by Prague) and 1979 (contested in Moscow), took charge of EISBAEREN BERLIN in the summer of 2007 after first adjusting to life in the Deutsche Eishockey Liga by guiding EG Duesseldorf for two seasons. That on account of Eisbaeren Berlin veteran ROB ZEPP, the 31-year-old workhorse who was busy reducing his goals-against-average in the European Trophy to a sparkling 1.62 per game while pushing his save percentage up to an impressive 95.7 percent. It should be remembered that, prior to signing with the German capital city club in the summer of 2007, Zepp had put in two seasons with Saipa Lappeenranta in the Finnish top flight. Not surprisingly, the Canadian-born version of the Berlin Wall was selected as first star of the European Trophy match with Karpat Oulu at the O2 World Arena. Germany goaltender ROB ZEPP (72) of Eisbaeren Berlin, who was selected by both the Atlanta Thrashers (in 1999) and the Carolina Hurricanes (in 2001) in the fourth round of the annual National Hockey League Draft, turns away Russia forward ALEXEI TERESCHENKO (23) of Ak Bars Kazan, the third round selection of the Dallas Stars at the 2000 NHL Draft, at the side of the net during the dramatic semifinal match of the 2010 IIHF World Championships at the Lanxess Arena in Cologne. A second goal from Sharrow, the 27-year-old import who is beginning his third season with Eisbaeren Berlin, set the final scoreline before even half of this European Trophy contest had been completed. The native of Framingham, Massachusetts, continued his red-hot goal-scoring ways, then, as five goals from seven games in this year’s European Trophy tournament equaled his total from a baker’s dozen contests in last spring’s Deutsche Eishockey Liga playoffs. Sharrow, who was chosen by the Atlanta Thrashers in the fourth round (# 110 overall) of the 2003 NHL Draft but progressed no higher than the American Hockey League, scored seven goals in 52 games during the 2011/12 D.E.L. regular season. No other defenseman at this 32-team European Trophy tournament can match Sharrow’s goal-scoring record. 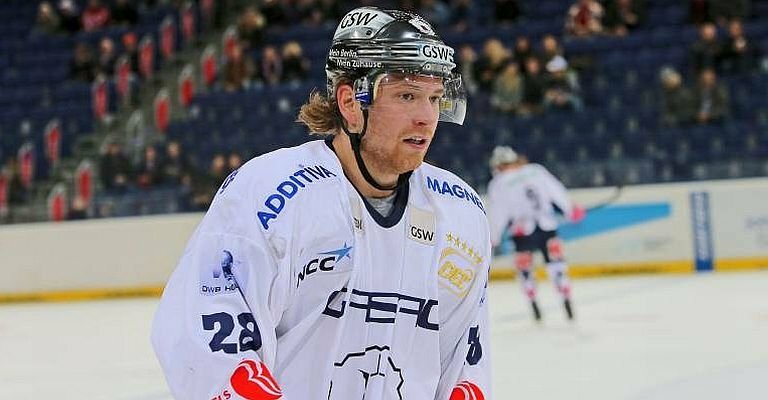 Veteran center T.J. MULOCK, the 27-year-old native of British Columbia who represented Germany at the 2010 Winter Olympic Games in Vancouver, was involved in the first two goals for Eisbaeren Berlin and now boasts a European Tournament-leading 10 assists, as well. Eisbaeren Berlin captain ANDRE RANKEL, another member of the Germany squad at the 2010 Winter Olympics held in Canada, also had two assists for the victorious home side against the Finnish visitors Karpat Oulu. Eisbaeren Berlin defenseman MARK KATIC, the third round (# 62 overall) choice of the New York Islanders at the 2007 NHL Draft who crossed the Atlantic Ocean this summer after three seasons with the Bridgeport Sound Tigers in the American Hockey League, follows his shot past youthful Karpat Oulu goaltender TOMI KARHUNEN (33) in the first period of the European Trophy contest at the O2 World Arena in the German capital city … Karhunen has been sharing European Tropthy time in the Karpat Oulu nets with Swedish veteran JOHAN BACKLUND, the 31-year-old former Philadelphia Flyers farmhand who made one appearance for the Adirondack Phantoms in the AHL in addition to just one other with the Trenton Titans in the East Coast Hockey League last term before transferring to the northern Finnish club in January … Backlund, who started six games for fourth place Sweden at the 2007 IIHF World Championships held in Russia, had played 74 AHL games for Adirondack Phantoms the previous two seasons combined. Eisbaeren Berlin’s new Canadian legionnaire MARK KATIC (71) celebrates a spectacular strike on behalf of his new employers in opening frame of the European Trophy contest with visiting Finnish side Karpat Oulu … Katic, who skated eleven NHL games while posting an assist for the New York Islanders during the 2010/11 schedule, leads all defensemen in the this European Trophy tournament with nine points (three goals) from seven games thus far. An urgent victory for Eisbaeren Berlin, even if the two-time defending champion who have won the German domestic title four times in the past five years cannot catch Swedish club HF Lulea for the top spot in the North Division. 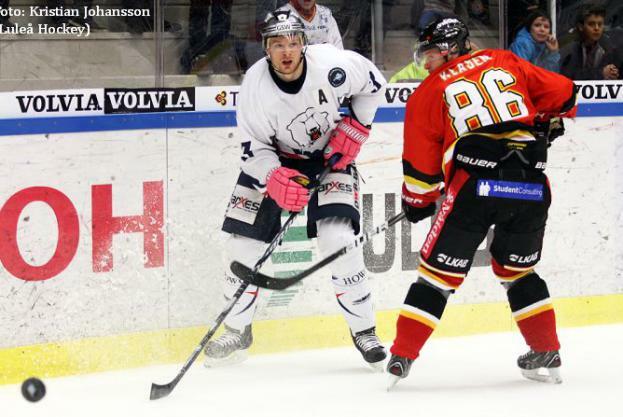 Despite having one October game with the table-toppers away in Sweden remaining on the schedule, Jackson’s troops have clinched second place in their own group and, with 16 points from seven contests, are currently positioned best among all other division runners-up in the race for the Red Bull Salute playoff tournament this coming December. At least one of the four 2nd place finishers from the four divisions will have to make way for Slovakian side HC Slovan Bratislava, who have no hope to qualify from their group but get automatic passage to the playoffs this year as co-host of the Red Bull Salute. HC Vienna Capitals do have two European Trophy matches to play and could easily finish second in the South Division. If the Austrian club does not, then another 2nd place team will also be harshly eliminated from the final tournament consisting of eight teams. At this late point in the race for the Red Bull Salute, only HF Lulea and fellow Swedish side HV 71 Jonkoeping have clinched their places at the Red Bull Salute as division champions while, at present, Finnish outfit Tappara Tampere and Swiss club EV Zug are the other two division leaders. Eisbaeren Berlin defenseman JIMMY SHARROW, an American who played his junior hockey in Canada for the Halifax Mooseheads before laboring five years for seven different clubs in the North American minor leagues, pursues the pass of Karpat Oulu right wing JUHO KERONEN (19) during the European Trophy contest witnessed by 6,800 spectators at the O2 World Arena in the capital city of Germany. Almost half a century ago, another American defender from Massachusetts named John F. Kennedy arrived in the very same city that the Eisbaeren hockey club now calls home and made the famous proclamation, “Ich bin ein Berliner.” … this 2012/13 campaign marks the third consecutive season that two-time Deutsche Eishockey League titlist JIMMY SHARROW can say the exact same thing. 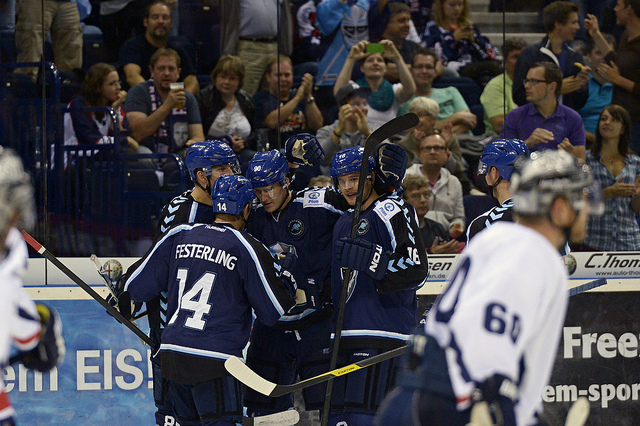 Despite letting a three-goal lead slip away in the third period and failing to convert a penalty shot opportunity in the final minute of the overtime session, the resilient HAMBURG FREEZERS held off the late charging visitors of EISBAEREN BERLIN and ultimately prevailed 5-4 in the shootout of this European Trophy contest at the 02 World Arena in Hamburg, Germany. Hamburg Freezers do complete the weekend sweep of the current two-time defending champions of the Deutsche Eishockey Liga in the most recent installment of the Anschutz Entertainment Group’s version of the DEUTSCHLAND DERBY for EISHOCKEY but, depending upon the results of upcoming matches yet to be contested in the North Division of the European Trophy, may have cause to regret the third period defensive struggle and subsequent loss of the point to their German rivals at a later date and time. Eisbaeren Berlin, having collected thirteen points from their first six European Trophy contests, do remain ahead of Hamburg Freezers, who have posted eleven points from their first half dozen tournament matches, in the compelling race for second place (and the final playoff spot) in the North Division. Hamburg Freezers experienced defenseman CHRISTOPH SCHUBERT (13) has appeared in 42 games (5 goals, 15 points) while representing Germany at nine major international tournaments, including both the 2002 and 2006 Winter Olympic Games, over the course of his career. The hosts did make a very bright start when former National Hockey League defenseman and current Hamburg Freezers captain CHRISTOPH SCHUBERT received a pass at the point and then proceeded to leisurely skated into the right faceoff circle to whip a laser-like wrist shot past Eisbaeren Berlin second-string goaltender SEBASTIAN ELWING with only 2:40 having expired off the clock. Canadian legionnaire MARK KATIC, the 23-year-old who crossed the Atlantic Ocean this summer after spending most of the past three seasons in the New York Islanders organization with the American Hockey League’s Bridgeport Sound Tigers and now leads all defenseman in the European Trophy tournament with eight points (two goals), brought Eisbaeren Berlin level, if only temporarily, nearly a dozen minutes in. Eisbaeren Berlin defenseman MARK KATIC (71) and Hamburg Freezers veteran forward SERGE AUBIN (10), the 37-year-old former NHL veteran who arrived at the Hanseatic club from Swiss outfit HC Friboug-Gotteron in the summer of 2011, tangle in front of the net during the European Trophy contest witnessed by 6,031 spectators at the 02 World Arena in Hamburg, Germany … Aubin was originally drafted by the Pittsburgh Penquins in 1994 (7th rd, # 161 overall) and later skated in 374 NHL games (44 go, 108 pts) for the Colorado Avalanche, Columbus Blue Jackets and Atlanta Thrashers; the native of Quebec also suited up in Switzerland with HC Servette Geneva and, while out on loan, EHC Biel-Bienne, before signing on with Hamburg Freezers. But the stalemate did not last long as the in-form Schubert, who appeared with the national team at the annual IIHF World Championships last spring for the first time since the 2008/09 campaign, struck again with a straightaway blast from between the circles at the top of the point only 43 seconds thereafter and, less than three minutes on down the line, veteran defenseman PATRICK KOEPPCHEN stole the puck in the neutral zone and strode forward to rifle a shorthanded slapshot past the hapless Elwing. A second goal in as many games for the former Germany national team rearguard this weekend, then, saw Hamburg take a commanding 3-1 first period lead. The deficit grew even larger when, almost four minutes into the second period, NHL draft pick JEROME FLAAKE grabbed a loose puck in the slot and fired a fourth goal to delight the Freezers faithful even further. Hamburg Freezers right wing JEROME FLAAKE (# 90, center), the good-sized, 22-year-old who had a breakout season with 19 goals and 35 points in the Deutsche Eishockey Liga last season, was selected in the fifth round (# 130 overall) from Koelner Haie by the Toronto Maple Leafs at the 2008 National Hockey League Draft and represented Germany at the annual IIHF World Junior Championships on three occasions. Canadian import BRANDON REID (5) of Hamburg Freezers, the 31-year-old veteran who signed from Swiss side SC Rapperswil-Jona this summer and once skated a total of 10 NHL games in four seasons combined with the Vancouver Canucks organization, gets set to face-off against Eisbaeren Berlin’s Denmark international center MADS CHRISTENSEN (60) as Germany Olympic winger ANDRE RANKEL (24) eyes the action for the visitors during the European Trophy contest at the 02 World Arena in the old Hanseatic League city. 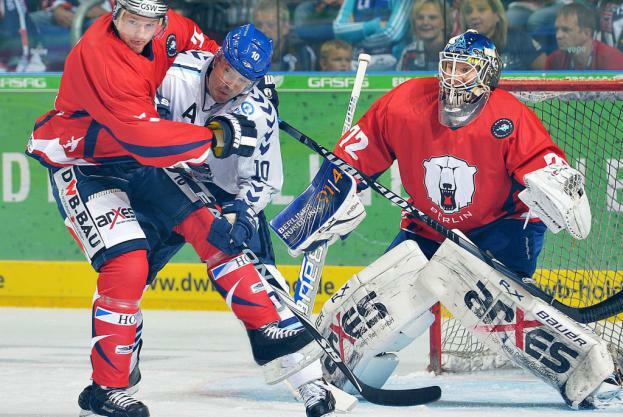 Eisbaeren Berlin have won the Deutsche Eishockey Liga title four of the past five years and were not prepared to fold its tent in Hamburg so quickly, however. American trainer DON JACKSON’s troops hung in there and began to chip away in earnest when, while operating on the power play, Denmark international center MADS CHRISTENSEN tipped a shot from the point past Germany national team goaltender DIMITRIJ KOTSCHNEW with less than four minutes left until the second intermission. Whatever Jackson had to say in the dressing room before the final period must have been found to be rather motivational, as well, for, not so long after play resumed, Germany national team winger ANDRE RANKEL was off on the breakaway. Rankel’s third goal in his last four European Trophy contests lifted Eisbaeren to within one and really began to rattle the nerves of the, apparently, fading Hamburg Freezers. Berlin continued to battle back and were rewarded with less than eight minutes to play in regulation time as the productive Dane Christiansen circled out from behind the Hamburg net back towards his own blue line and then hopefully dumped the puck back in on net. The floating black disc took a favorable bounce off of Eisbaeren Berlin forward T.J. MULOCK, who would be credited with three assists in this European Trophy meeting, and fell very kindly in front for veteran defenseman JENS BAXMANN, the 27-year-old, former youth team product who quickly equalized for the visitors. The hosts had one more fabulous chance to settle the affair when awarded a penalty shot in the very last minute of overtime. But Hamburg Freezers veteran Canadian legionnaire GARRETT FESTERLING, the 26-year-old who won the D.E.L. title with Hannover Scorpions in 2010 and scored a big goal against Eisbaeren Berlin on Friday night in the German capital city, could not convert. And so it was off to the shootout proper, then. With the very first shot of the shootout decider, imported Hamburg Freezers left wing MATT PETTINGER (22), the 31-year-old, Canadian off-season acquisition from Koelner Haie who skated 422 games and scored 65 goals for the Washington Capitals, Tampa Bay Lightning and Vancouver Canucks in the National Hockey League previously, slips the puck between the legs of Eisbaeren Berlin second-string goaltender SEBASTIAN ELWING (25) for what will prove to be the only tally of this European Trophy match tie-breaker at the O2 World Arena in Hamburg, Germany. New Hamburg Freezers alternate captain MIKE PETTINGER (22), the native of Edmonton who was taken by the Washington Capitals in the second round (# 43 overall) of the 2000 NHL Draft, watches the puck bulge the net behind Eisbaeren Berlin goaltender SEBASTIAN ELWING (25) in the shootout …… a youthful Pettinger, who ultimately appeared twice with Canada at the annual IIHF World Junior Championships, concluded his freshman term at the University of Denver by celebrating an NCAA championship in 1999 but decided to leave school halfway through the next season and would join the Calgary Hitmen of the junior Western Hockey League …… Pettinger managed to record 20 goals for the Washington Capitals during the 2005/06 NHL campaign and also represented Canada at the 2006 IIHF World Championships hosted by Latvia that season, as well. Eisbaern Berlin right wing JAMIE ARNIEL (9), the newly-arrived Canadian import who appeared in exactly one NHL contest during the 2010/11 campaign for the eventual Stanley Cup champion Boston Bruins and spent all of last season with the Providence Bruins of the American Hockey League, is turned away by Hamburg Freezers goaltender DIMITRIJ KOTSCHNEW (30), the national team veteran just returning from Russia who was credited with 67 saves in the two games against the two-time defending Deutsche Eishockey Liga champion over the weekend, in the second round of the shootout which decided the European Trophy contest at the O2 World Arena in Hamburg, Germany. Copyright © 2012 WORLD HOCKEY. Powered by WordPress and A Dream to Host theme by Art of Blog.